The sea floor of Fram Strait, the over 2500 m deep passage between the Arctic Ocean and the Norwegian-Greenland Sea, is part of a complex transform zone between the Knipovich mid-oceanic ridge of the Norwegian-Greenland Sea and the Nansen-Gakkel Ridge of the Arctic Ocean. Because linear magnetic anomalies formed by sea-floor spreading have not been found, the precise location of the boundary between the Eurasian and the North American plate is unknown in this region. 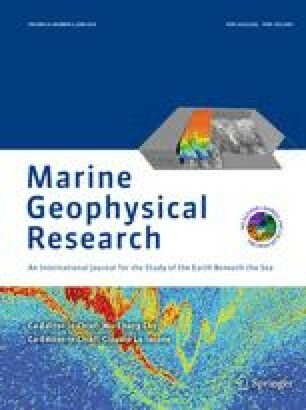 Systematic surveying of Fram Strait with SEABEAM and high resolution seismic profiling began in 1984 and continued in 1985 and 1987, providing detailed morphology of the Fram Strait sea floor and permitting better definition of its morphotectonics. The 1984 survey presented in this paper provided a complete set of bathymetric data from the southernmost section of the Svalbard Transform, including the Molloy Fracture Zone, connecting the Knipovich Ridge to the Molloy Ridge; and the Molloy Deep, a nodal basin formed at the intersection of the Molloy Transform Fault and the Molloy Ridge. This nodal basin has a revised maximum depth of 5607 m water depth at 79°8.5′N and 2°47′E.